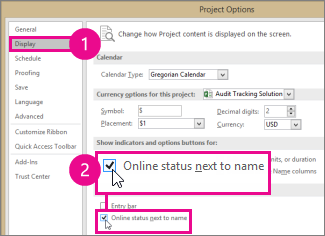 You can choose to turn off the online status that shows up next to names in Project Professional 2016. This presence indicator enables you to IM team members using Skype for Business. Click File > Options, and then click Display. Clear the Online status next to name check box, and then click OK to turn online status off.